A free iPad App that allows elementary school (K-5) teachers to easily keep track of each students' Fountas & Pinnell reading levels and reading conferences. The current reading levels of their students. If a student is Exceeding, Meeting, Approaching or Below Standards by color coded reading levels. When they met with a student for a reading conference. Which students need to have a reading conference by the color coded reading conference date. What the current goal of each student current is. Sort students by reading level and quickly create reading groups. Sort students by when they last had a reading conference to know who needs a conference next. Sort students by first or last name. Print individual student or class data. An AirPrint printer is required to print from iPad. Email and share class data as a PDF file. Email and share student data as an HTML file. Backup your Reading Conferences data to Dropbox. A free Dropbox account required for backup. 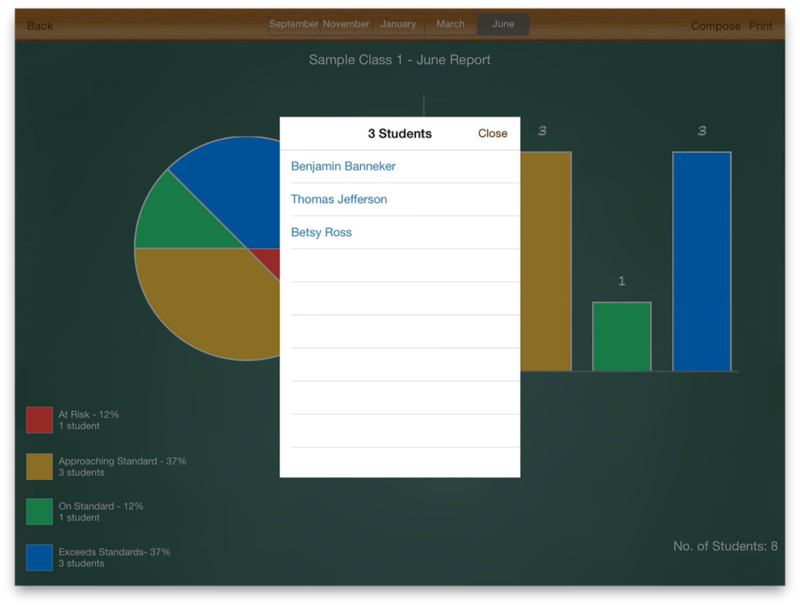 We have made it easy for teachers to generate data reports about the reading levels of their class and individual student. These detailed reports can be shared with administration, staff or parents via email or printed. Lastly, teachers can feel secure and backup their data to Dropbox (A free Dropbox account required, of course). Settings window with Dropbox backup options. For info on how to backup your data click on the How To section. Fountas & Pinnell reading levels are a system of reading levels developed by Irene C. Fountas and Gay Su Pinnell to support their guided reading method, commonly referred to as Fountas & Pinnell. 4BusyTeachers is in no way associated or affiliated with Fountas & Pinnell or Heinemann Publishing, a division of Houghton Mifflin Harcourt.